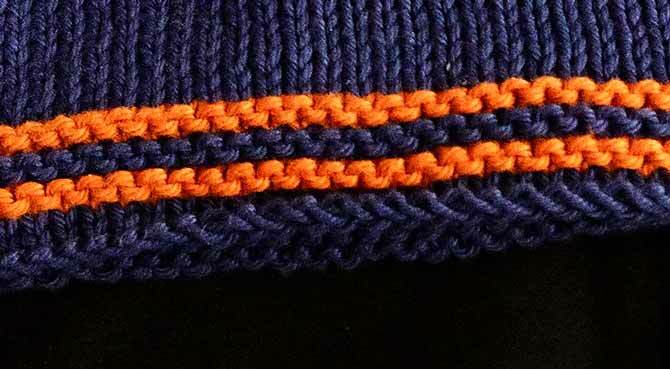 I’m probably dating myself, but do you remember when blue jeans were stitched with this coppery orange thread? Was that the ’70s and ’80s? None of my jeans now seem to have that look. 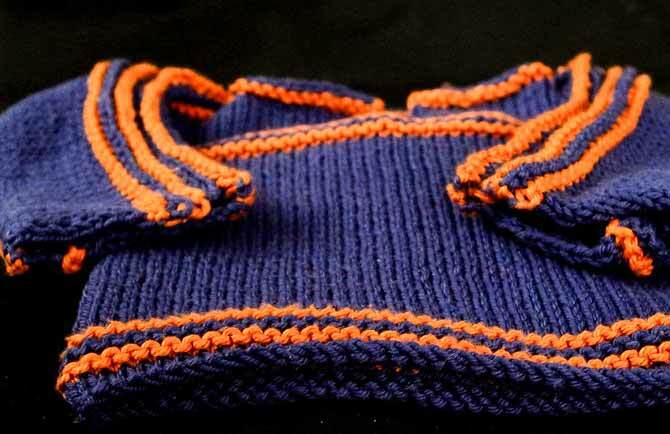 So I decided after looking at the 48 colors of Cotton Supreme by Universal Yarn, that I would take their ‘denimy’ blue and the copper and knit a little kid’s sweater reminiscent of those blue jeans from my childhood. I didn’t want the child’s sweater to look like jeans though, so I worked in a bit of garter stitch and a mostly stockinette in this soft and comfy yarn. I didn’t work with the DK weight of Cotton Supreme this time, but there are some free patterns if you’d like to see one or two other possibilities for this cotton yarn at a finer weight. It would be great for crochet as well as it’s finer and wouldn’t be as bulky. 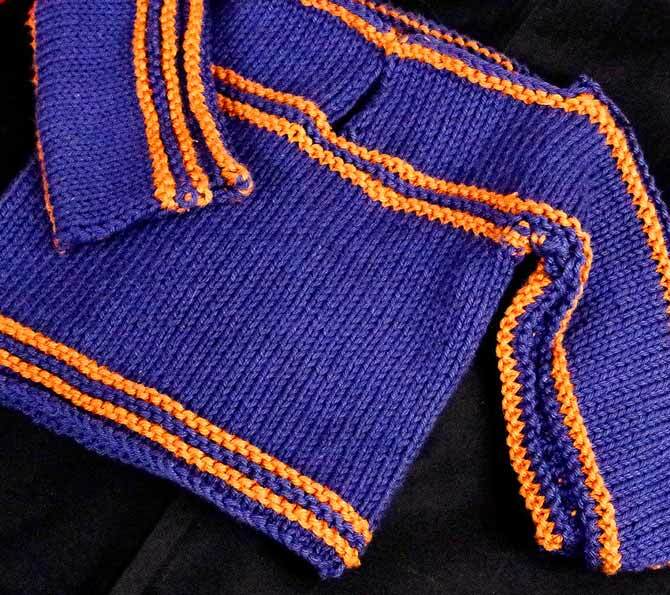 I used the worsted weight and for this size 12-18 month top, it took 1 full hank of the blue and a few meters of the copper accent color. The copper color of the Cotton Supreme isn’t quite as orange as it looks in the picture. That has something to do with my camera and the lighting. It’s much more of an ochre or terracotta tone to it. This sweater is knit in the round from the bottom up to the armholes. Then I divided the stitches for front and back and cast on stitches on both sides for the sleeves and then just worked across both sleeves and upper body till I had the depth of the armholes done. There are 3 seams, 2 for the underarm, and then one for the upper sleeve/shoulder seam. If I were to knit this easy child’s sweater again, I would probably use a provisional cast on for the sleeves and graft the under sleeve and then not cast off on top but graft that section together as well. But not all beginners would be happy learning to graft and then to have all those stitches to seam together with the Kitchener stitch. When I got part way up the front sleeves and upper torso, I divided the stitches onto two needles and continued separately to provide a slight neck opening. I like the casual look, so this could be left open and the flaps would fold down like 2 little lapels, but it would be easy enough to crochet on a button loop and sew on a button or two. I don’t have any grandchildren yet (and sons…you get through post-sec studies before you think of making me a grandfather), so I may hold onto this little top or gift it to the next friend who has a baby. It took me about 6 hours to knit it, and I’m not the speediest of knitters. But It was a perfect project for knit-night. Knitting for kids with Cotton Supreme is probably one of the best uses this yarn could be put to. 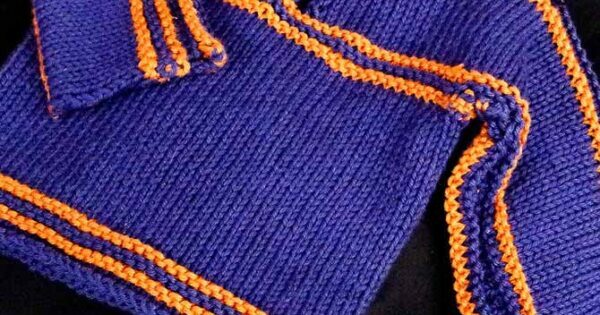 It’s very soft and even the worsted weight yields a nice light fabric. In the next few days, we’ll look at some other projects you could make with this 100% cotton yarn. The Universal Yarn website has some other kids’ patterns for this yarn. And, for those of you who like to make a little something for Easter, here is a cute egg pattern to knit with Cotton Supreme.